Members of Far Away Creations are extras in a movie called "Paul" with Simon Pegg and Nick Frost. The blaster and lightsaber were custom props we put together for Simon and Nick. You may know Simon and Nick from one of there other "little" movies, "Shaun of the Dead"
My wife Kathy and I (Cal Pierce) are both in the movie for a second or two as are a few good 501st friends as well. 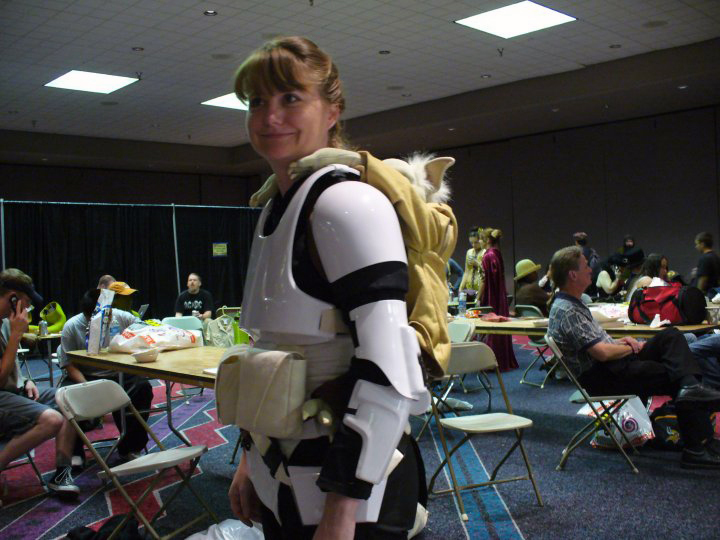 (The "501st" is a world wide Star Wars costuming organization: www.501st.com). We were acting out our own "scene" in the background, for the end of the movie shot. The following photos are screen captures from the movie. You can see a blurry shot of Cal in the beginning of the movie during the shot where they are playing the Virtual Reality game. Kathy almost gets run over by Simon Pegg in the shot when he runs over to join Nick at the sword vendor booth. She is wearing her Biker Scout armor without her helmet. There is a gal (I forget her name dangit!) who is wearing a Jawa costume. She has one of our Jawa masks! This part is strange...when Simon and Nick go to Area 51 to see the mail box. Notice... there is a "City of Loveland" sticker on the mail box. Bizarre... since we live in Loveland and all. I swear we had nothing to do with that! 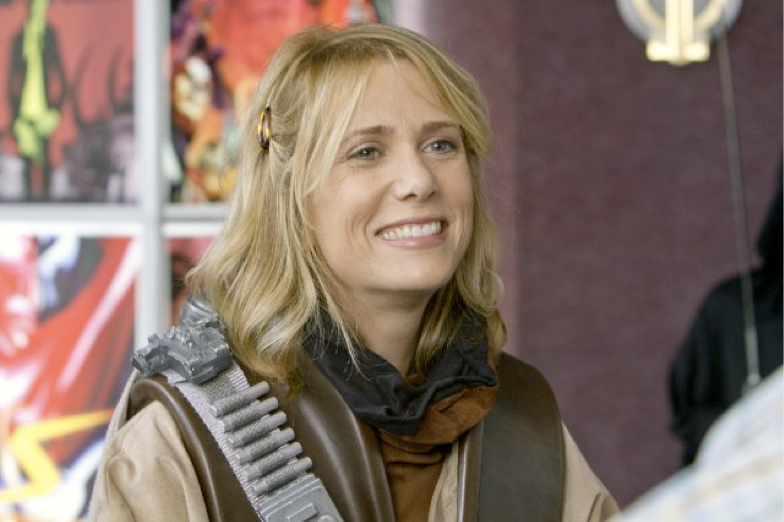 Our Boushh bandolier has some screen time as well at the end of the movie as part of the costume worn by Kristen Wiig. Originally we were in the scene for the end of the movie but that was cut and re-shot. It was a bummer for a second and then I saw our bandolier prop so that kinda made up for it. This movie fits well with our sort of "geekdome". There are a lot of great one liners and references to all of our favorite movies plus it is a fun story! It's amazing that with two - 16 hour days of shooting and they may have kept 2 minutes of footage for the scenes we were there for. We were hoping we would have been in there more but that's o.k. It was a fun time.